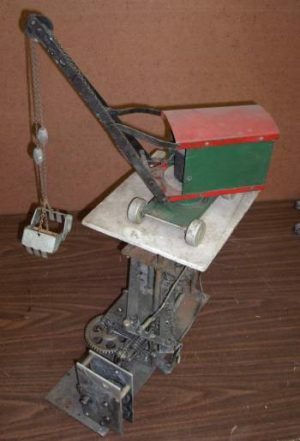 This authentic Erie Digger mechanical mechanism is offered just as it came out of service in the mid-1970s. It is quite original, with only minor modifications by past owner/operators. It is in original paint and has the original Structo Toy tin-work undercarriage with stamped metal wheels. It has been bench-checked here in the Vintage Amusements studio and is complete and working properly through the mechanical cycle. This mech may be used as it is or restored and placed into a reproduction cabinet you can build, or have built, using plans offered elsewhere in this store. A hand crank assembly and a coin mechanism are part of the cabinet and are not included, but are also offered in this store. If you are interested in doing a digger project this is an economical approach to owning your own antique digger. Similar mechanisms like this one are occasionally offered on eBay and can be purchased at auction in the range of $275. +or-, however it can seldom be known if the mechanism is complete or working properly. This one is guaranteed to be working properly and is backed-up by email support for adjustment and repair after the sale.